Is It Possible to Make Rain? One of the best weather making operations to perform is the building of snowpacks. Throughout the West rivers, streams, creeks and reservoirs all depend upon the snowpack for their year’s water. Beginning in the early winter, periodic rainmaking operations are done to influence snow buildup in the major mountain ranges – Cascades, Sierras, Rockies -- and all intervening mountains and highlands. This approach is very effective as we have demonstrated in winter operations in Montana , Idaho , Oregon , California and New Mexico . Perhaps the best example is evidenced here in the Mt Shasta area, where we live. In 2000 the United States Geological Survey resurveyed the glaciers of North America to compare to an identical survey taken back in 1979. The USGS found every mountain glacier, of hundreds in North America , had shrunk in the last 30 years . . . except the glacier on Mt Shasta, which had actually grown. In fact, according to the California Academy of Sciences, “Whitney glacier on Mt Shasta is the only ice river in the world that is larger today than in 1890.” (Sacramento Bee, September 4, 2006). Scientists attributed this growing glacier to a unique over-abundance of snow on Mt Shasta in the recent years past, unlike, for some reason, the rest of the extensive chain of Sierra and Cascade glaciers. According to Frank Christina, the National Weather Service observer in Mt Shasta for the last 20 years “. . . the 10-year weather information report for the 1990’s showed an increase in Mount Shasta’s historical yearly precipitation average from 36 Inches to 37.11. 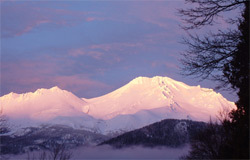 The average temp of 49 degrees remained the same.” (Mt Shasta Herald, October 11, 2006). I moved here in July of 1992. That month began the 7th water year in a row in drought, extremely severe at that point with water rationing throughout the state. By the end of that winter season, however, Northern California had experienced one of its greatest water years on record, every reservoir and storage facility in the entire state was filled. Building a snowpack, assuring that at least average precipitation is falling throughout the winter months and so assuring at least average water storage for the following year, is something we have accomplished many times in many states over the last 15 years.